Please consider attending one of the other two field days that are being held this month in central Nova Scotia: "An Introduction to Woodland Ownership & Management" on Oct. 14 near Amherst, or "Working on Your Own Land" on Oct. 20 near Wentworth. Click on the links to learn more. Space for these events is limited, so please register soon. 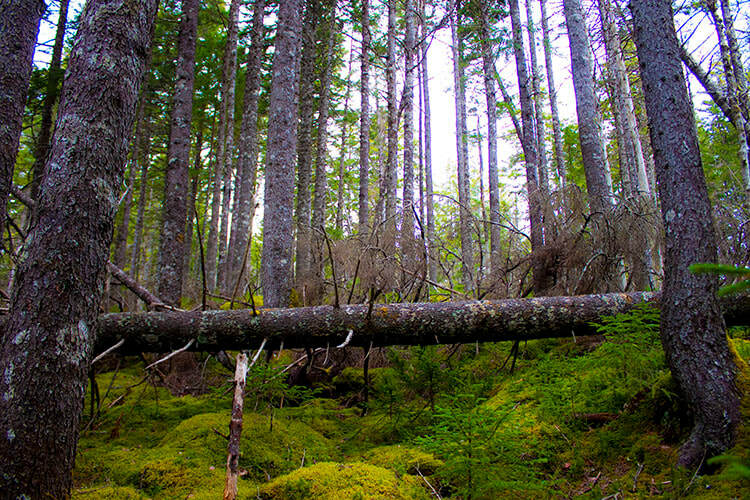 ​Big trees and careful logging are not a thing of the past in Nova Scotia. Woodland owners can learn more about managing and harvesting a mature forested parcel at a field day Saturday, October 6th, in Cooks Brook, NS (Halifax Regional Municipality). Because this event is planned for the Thanksgiving weekend, the agenda also includes a discussion about planning for the transfer of a family woodlot to the next generation. If your children and grandchildren are home for the holiday, this is a great activity for the whole family! The 182-acre (74 ha.) woodlot, which is well-stocked with mature red spruce and hemlock, is owned by Carol Casselman. Employees of Conform Ltd., the landowner cooperative that is working with Carol, will talk about how her personal goals for the woodland and a timber inventory of the property were used to develop a long-term management plan. Both new and veteran woodland owners will enjoy this close-up look at “Harvesting the Old-Fashioned Way.” You’ll walk with the forester and logger who laid out the harvest and learn more about their decision-making process at each step, starting with earning the landowner’s trust. You’ll also explore why Carol and Conform settled on a selection cut using a traditional chainsaw crew, how they laid out the harvest, and what they achieved. This field day is hosted by Conform and the Nova Scotia Woodlot Owners & Operators Association. The price is just $10 per person or $20 per family, which includes a light lunch. Registration has closed! To register, please fill out the online form below. You can also call Andy Kekacs toll-free at 1-855-NS-WOODS (1-855-679-6637). Keep in mind that what happens on the woodlot next door is almost as important as how you manage your own land. You are welcome to encourage your neighbours, friends and family members to attend. The Casselman woodlot is located on the Wilson Road in Cooks Brook, which is about 14 kms from the Exhibition Grounds in Middle Musquodoboit, Halifax Regional Municipality. To see a map, click here. Why choose selection harvesting with a chainsaw crew here? Were the landowner’s goals achieved? What future activities are planned? 12:30 Open discussion: What do family forest owners need to achieve their goals? ​We have reached capacity for this event.